Background: Physical activity is known for its many health benefits; among them being the positive effect on bone health during the life cycle. During childhood, physical stress stimulates bone remodeling and increases density. However, due to hormonal changes during adulthood, and mainly during postmenopause the rate of bone remodeling is slowed down and is less efficient. As a result, argument has arisen in the literature regarding the benefit or harm of physical activity on bone health among postmenopausal women. 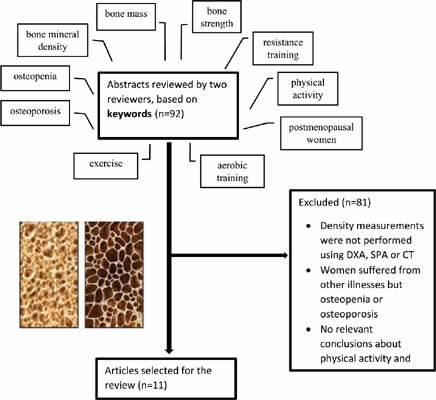 Objective: The study aims to examine the efficacy of physical activity for improving Bone Mineral Density (BMD) in postmenopausal women based on a review of the literature. Methods: The articles included in the review were chosen from three databases (PubMed, SPORT Discus with full text and Science Direct). Only publications with intervention studies which provided BMD measures clearly affected by physical activity in postmenopausal women were included. Twelve articles met the criteria for inclusion. Results: In general, physical activity had a positive effect on BMD. Exercise prevented bone loss and in some cases, it contributed to the increase in BMD. Conclusion: Physical activity may improve BMD in postmenopausal women. However, the exact type of activity, its intensity, its duration and its frequency, are still unclear. Further studies are needed to determine the precise training protocol for postmenopausal women. Keywords: Physical activity, bone mineral density, osteoporosis, postmenopausal, life cycle, hormonal changes. Keywords:Physical activity, bone mineral density, osteoporosis, postmenopausal, life cycle, hormonal changes. Abstract:Background: Physical activity is known for its many health benefits; among them being the positive effect on bone health during the life cycle. During childhood, physical stress stimulates bone remodeling and increases density. However, due to hormonal changes during adulthood, and mainly during postmenopause the rate of bone remodeling is slowed down and is less efficient. As a result, argument has arisen in the literature regarding the benefit or harm of physical activity on bone health among postmenopausal women.